University of Stirling Business & Marketing student Mathias Eggenberger tees off today in the student equivalent of the Ryder Cup. 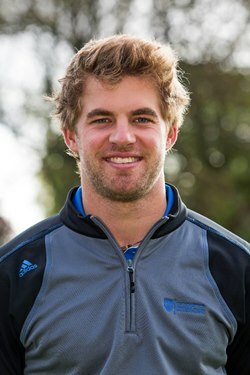 The Stirling scholarship golfer is the only British-based player in Team Europe for the Palmer Cup, the transatlantic tournament which pits the best golfers at European universities against their American counterparts. It is recognised as a springboard for emerging talent, with previous Palmer Cup players including Rickie Fowler, Luke Donald, Webb Simpson and Graeme McDowell. The three-day tournament, named after legendary player Arnold Palmer, takes place at Rich Harvest Farms in Illinois, with the USA looking to wrest back the Cup from Team Europe following their 2014 victory at Walton Heath. Team Europe is led by Head Coach Jean Van De Velde, whilst there is further Scottish influence with his Assistant the multiple Solheim Cup player Janice Moodie. Mathias, from Liechtenstein, was selected following his win at the R&A Foundation Scholars Tournament at St Andrews. That victory came after an impressive performance this time last year at the Swiss Challenge Tour where only his amateur status meant missing out on €10,400 pay day after he tied third. He said: “To be in the team of the best Europeans is a great honour. It gives me confidence that all the work I have been putting in has been worthwhile. It’s the best European student golfers against the best Americans so it’s a Ryder Cup for students. “We are there to win it and all I can do is give it my best. It’s at a brilliant parkland course, just like at the Challenge Tour and the type of venues I’m used to when I’m back home. “To know so many famous players have competed in the Palmer Cup and gone on to succeed as professionals is motivating. I’ve chosen the University route as many established Tour players – like Richie Ramsay at Stirling – have followed it and it’s important for me as even if golf doesn’t work out, I have a degree in my back pocket. Mathias, who represents his father’s native Switzerland on the international stage, will have called upon advice from his University team-mate Jack McDonald, who was part of the victorious team in 2014. Head Coach Dean Robertson said: “It is a great opportunity for Mathias to go head-to-head with some of the finest players emerging in the USA. Many of the American players will also form their Walker Cup team so it is an excellent level for Mathias to compare himself against. Mathias is one of 17 current Golf scholarship recipients studying at Stirling. His team-mates include Irish International and two-time British Universities Strokeplay Champion Cormac Sharvin; Curtis Cup player Eilidh Briggs and current Scottish & British Universities Strokeplay Champion Gemma Batty.